A former pair of petrol stations, although only the northbound side is signed as an official service station. The former southbound Gulf forecourt. The southbound side was built in the 1950s, while the northbound side is newer - 1970s or '80s. In 1988, Roadchef planned to build a restaurant next to each forecourt, but their plans were refused. In 1990, Blue Boar planned to build a restaurant, shop, tourist information centre and motel beside the existing southbound forecourt, but this plan was refused too. The northbound side was taken over by Euro Garages in late 2015. Until then it included 'On the Run' branding and a Costa Coffee unit. 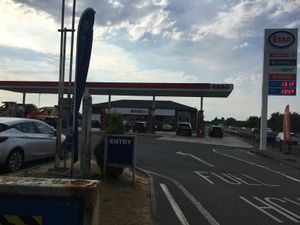 The southbound side had been a Gulf filling station operated by Bayford Group which was left derelict for a while until 2018 when BP Express bought the site. The new filling station is currently being built and is due to feature an M&S Simply Food store and Wild Bean Café.